I've mentioned my interest in emotional mapping before. So I enjoyed this article in the New York Times on the subject of Mining the Web for Feelings, Not Facts. It points to the potential for using the web to track 'the mood of the nation' in real time. Hence the image: a screen grab I took from one of the sites mentioned in the NYT piece: tweetfeel. I just typed in the word 'Ireland' and it tells me that tweets mentioning Ireland in a positive way are currently running at more than two to one times greater than negative tweets! My company's latest Economic Recovery Index for August points to a modest improvement in Irish consumer sentiment from July, mostly reversing a severe weakening from the previous month. All-in-all it points to consumers who are less pessimistic but not a lot more optimistic about the outlook for the economy. Though it's nice to see that the majority of us continue to experience 'enjoyment' and 'happiness' a lot regardless of the state of the nation! First, the freeze on mortgage repayments is due to end in November. The fifth of mortgages that are in yen or Swiss francs face a doubling of payments. Krona mortgages also face big increases in payments because they are tied to the consumer price index, which has shot up with the krona’s collapse. House prices are down 20 to 30 per cent, leaving many with houses worth only half the mortgage. The government asked the nationalised banks to show leniency, but repossessions will probably jump after mortgage payments are unfrozen. Second, government spending, sustained so far by heavy borrowing, is due to be cut 20 to 30 per cent later this year, affecting health, education, social security and infrastructure. A wide range of taxes will be raised to try to eliminate the budget deficit by 2013. ... Third, the capital controls that have protected against capital flight are to be eased as part of the process of financial reintegration; but at the cost of high interest rates, currently 12 per cent, which choke investment. If the government accepts British and Dutch terms, Iceland’s taxpayers will take on an Icesave debt equal to half the country’s 2008 GDP. Q. What do an Icelandic bank and Icelandic streaker have in common? A. They both have frozen assets. 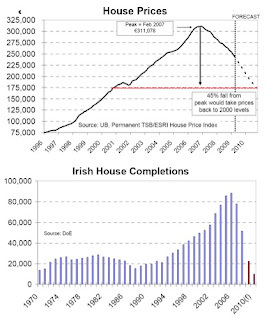 I guess it shows how punch drunk we are from economic shocks that Ulster Bank can blithely forecast a 45% fall in house prices from their peak - as they did in their Irish Economy Commentary last week - and most people shrug in acceptance. Not even their forecast of just 10,000 house completions next year (down from 90,000 only three years ago - see chart) caused much of a stir. But not everyone is so accepting and indifferent. Those selling their homes right now are probably more than a little concerned about housing and house price trends. Partly the concern is that of negative equity - a worry I have considered to be overblown in the past. Others are perhaps less sanguine than me about the extent of negative equity - Ronan Lyons for one, as well as Liam Delaney. Our results show that homeowners, on average, overestimate the value of their properties by between 5% and 10%. We also find that the overestimation is mostly related to capital gains, while owners tend to accurately translate the original price that they paid for the house into the home’s current market value. There is, however, considerable variation depending on when they bought their homes. This points to the persistence of the economic fundamentals surrounding the time that individuals decide to purchase a home at a given price, which ends up reflecting in the self-assessed valuation of that property close to the time of the sale. While most individuals overestimate the value of their properties, individuals who bought during more difficult economic times tend to be more accurate and, in some cases, even underestimate the value of their houses. We find a strong correlation between accuracy and the economic conditions (measured by the prevalent interest rate, the growth of household income, and the growth of median housing prices) at the time of the purchase of the property. Those who bought during tougher economic times are, on average, more accurate in their assessments. Our results provide some explanations for the difficult situation currently faced by a growing number of homeowners. The pattern that we document is consistent with the buildup of unrealistically optimistic expectations regarding the rate of home price appreciation among individuals who bought in good economic times or times of loose credit. In turn, these individuals take on risky financial commitments that make them more dependent on price appreciation to build equity in order to accommodate an adverse event, such as an increase in interest rates. This does suggest that if you are a home buyer then you might want to just focus your attentions on those houses that have been owner-occupied for some time - ideally since the economically depressed 1980s. And if you can't find a reasonable seller you can always just follow the New American Dream and simply rent. If the Ulster Bank forecasts are correct then prices may well be even lower this time next year. I've noted before that there seems to be a distinct gender bias in our current recession, but now I'm not so sure. 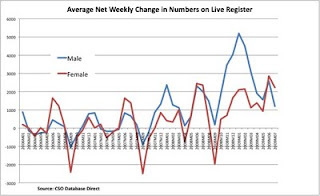 Maybe it's just a matter of timing: men got hit by the recession first (see chart), but now it's the women's turn (as indicated by average weekly net changes to the live register these past few months). One plausible explanation for this could be that traditionally male employment sectors (e.g. : construction and finance) got hit first by the Great Recession, but now the wider economy is feeling the impact as are more female employment sectors (e.g. : retail, services and some public sector categories). The great shift of power from males to females is likely to be dramatically accelerated by the economic crisis, as more people realize that the aggressive, risk-seeking behavior that has enabled men to entrench their power—the cult of macho—has now proven destructive and unsustainable in a globalized world. As governments the world over struggle to get budgets back into balance post the recession, it may be women who lag behind men as we move into recovery because sectors such as technology and energy (still predominantly male) will lead a return to economic growth. Even if the she-conomy is more a figment of some commentators' imaginations, there is one aspect of the gender impact of the recession that is more real, namely in developing countries. Traditionally economic development has seen women and men move from agricultural employment to employment in factories and construction. But the worldwide recession has had a devastating impact on both categories of employment - especially for women working in factories supplying markets such as the United States. It looks like being an 'equal opportunity' recession after all. There are two reasons for Asia’s better prospects. One: faster population growth in South Asia means that these countries’ middle classes are growing more quickly. 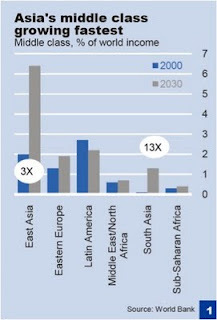 Two: although the population in East Asia is growing more slowly than in other regions, its annual per capita income growth is much higher (almost twice that in Sub-Saharan Africa) so it will still increase its share of global income in that time frame. The burgeoning of Asia’s middle class makes it an important consumer market, an engine of economic growth in the region, and an important global political force. They even think that Asia's emerging middle class will eventually take over the consumer-spending-as-global-economic-engine mantle from the United States in due course. Though not any time soon. A similar theme emerges in a recent guide to China's MegaTrends: trend number 3 is the rise of China's middle class. By 2050 the average Chinese citizen is projected to have the same standard of living as an Eastern European. The future (still) belongs to the Middle Class, even as large swathes of Ireland's middle class experiences upward then downward social mobility in a single generation. I recently listened to a fascinating and inspiring interview with Ayaan Hirsi Ali over at Point of Inquiry. She describes her own personal journey from a strict Muslim upbringing in Somalia to her life today in the West (including police protection because of her outspoken criticisms of the treatment of women in many Muslim countries). In the course of the interview she is asked why there wasn't a Muslim equivalent to the Renaissance which lead to the emergence of a secular state in the Christian West. Ali sets out some of the most common explanations, e.g. : Sharia law never allowed for a separation of Church and State the way such a separation existed from the conversion of the Roman Empire onwards in the West. So there was no 'gap' in which a secular, scientific 'revolution' could take place in the Islamic world (nor is there one yet in those Islamic countries run effectively as feudal fiefdoms). It's a debatable point of course (debatable, that is, if you have the good fortune to live in a country where airing such views doesn't earn you a visit from the Mutaween). Indeed, Islam may not have had its Renaissance but it came close enough thanks to the role Muslim philosophers played in preserving, translating and ultimately re-introducing Greek philosophy to the Christian world via Spain. But what struck me listening to Ali was that it doesn't matter - we've already had the Renaissance - and the world has been changed forever because of it; and not just the formally Christian parts. Indeed, it is right to think of Christianity as one of the six pillars of Western Civilisation. So whether Islam eventually has its own Renaissance is, for all practical purposes, irrelevant. Though this is not dismiss the need for reform in many Muslim countries, not least an end to their grotesque misogyny (for example: female circumcision) - which Ali herself suffered and discusses in the interview. Nor is it to ignore the fact that Muslim extremists - many of them educated in sciences developed in the West - have used the same knowledge and technologies to attack the West. But their attacks are, relatively speaking, trivial: they do not and cannot threaten the survival of Western Civilisation (or even a single country for that matter) in the way that, say, the Soviet Union of old might have. Europeans who considered churches houses of stupidity, sexism, and superstition didn’t know enough about mosques or ashrams to form a judgment, and left them unmolested. They abolished the old and much-mocked nationalistic school lessons about the virtues of nos ancêtres les gaulois, but absorbed the new lessons about the virtues of other cultures, and the justice and nobility of exotic political causes, with a childish credulity. Immigrants could indulge certain comforting prejudices and myths that natives would be disciplined, chastised, ostracised, or jailed for indulging. Effectively, diversity meant taking old hierarchies and inverting them. Yet I feel there's a sense of 'that was then, this is now' about much of the debate about Europe and its alleged Islamic future. Maybe it's to do with the worldwide economic downturn, and maybe even with the legacy of Iraq and Afghanistan, especially in those countries with troops serving there. But I find the idea of an 'Islamic threat' to the West to be increasingly ridiculous. The grim economic, social and political problems now facing many Muslim countries (especially Arab countries) certainly does not bode well for the Middle East (nor for the millions of men and women there who wish for and could build a better future for themselves and for their children if they had some of the same options we take for granted in the West). The result has been a rediscovery of the continent’s Christian roots, even among those who have long disregarded it, and a renewed sense of European cultural Christianity. 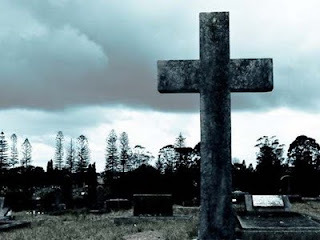 Jürgen Habermas, a veteran leftist German philosopher stunned his admirers not long ago by proclaiming, “Christianity, and nothing else, is the ultimate foundation of liberty, conscience, human rights, and democracy, the benchmarks of Western civilization. To this day, we have no other options [than Christianity]. We continue to nourish ourselves from this source. Everything else is postmodern chatter.” Europe may be confronting the dilemmas of a truly multifaith society, but with Christianity poised for a comeback, it is hardly on the verge of becoming an Islamic colony. Europe is in better shape than its chattering classes sometimes realise: even our birth rates are steadily rising (pdf) - surely a good sign for the future? Luckily for us - and for Ayaan Hirsi Ali and other brave women and men like her - the Renaissance only needed to happen once. And it did, in the Christian West. Ali, you, me and billions of others have benefited from that fortunate historical event, and continue to do so. And so eventually will all our fellow human beings living under the gaze of the Mutaween - please God, Allah, Buddha or the Big Bang, whichever you prefer. I was on the island of Inchagoill on Lough Corrib at the weekend. I was visiting the sites of 5th and 12th century churches that were once part of a monastic teaching network that at its peak in the Middle Ages saw - according to our guide - some 3,000 students from around Europe studying at Cong in Mayo. Another reminder that we have a long history of providing world class education in this country. But that world of education has long gone, and the current one may be about to undergo a similar fate. I'm beginning to think that universities are a bit like newspapers: wonderful institutions whose time may, alas, have gone. Or at least, institutions coincidently on the threshold of their greatest transformation since their foundations way back in the distant past. "Graduate education," he began, "is the Detroit of higher learning. Most graduate programs in American universities produce a product for which there is no market (candidates for teaching positions that do not exist) and develop skills for which there is diminishing demand (research in subfields within subfields and publication in journals read by no one other than a few like-minded colleagues), all at a rapidly rising cost (sometimes well over $100,000 in student loans)." An evaluation study of 350 Cornell students found that those who were asked "deep questions" (that elicit higher-order thinking) with frequent peer discussion scored noticeably higher on their math exams than students who were not asked deep questions or who had little to no chance for peer discussion. Dr. Terrell explains: "It's when the students talk about what they think is going on and why, that's where the biggest learning occurs for them…. You can hear people sort of saying, 'Oh I see, I get it.' … And then they're explaining to somebody else … and there's an authentic understanding of what's going on. So much better than what would happen if I, as the teacher person, explain it. There's something that happens with this peer instruction." Which brings us back to the continuing (and necessary) debate in Ireland about third level education and the efficacy of second level education in producing sufficient numbers of students with appropriate levels of mathematical abilities etc. Too often it seems that third level education is simply an extension of the second level experience but with bigger class/lecture hall sizes. Prof Tom Collins is quoted in today's Irish Times as condemning our existing educational system for failing to induce a 'love of learning' among students. Part of the reason, he believes, why we are underachieving on certain educational attainment measures compared to other countries. Universities around the world are now engaged in a 'race to the top' as institutions like MIT effectively 'level up' the quality of educational content. Therefore the real point of educational differentiation (and superior performance) will come not from content but from the learning experience itself. Something we've had a lot of practice at over the centuries. Monasteries for the 21st century - there's an interesting thought. 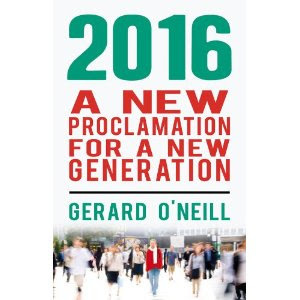 What do you think is "the most acute social problem in Ireland at this juncture"? Unemployment perhaps, or access to adequate health care, or maybe homelessness? No - if you are Dr Michael Loftus then the most acute social problem facing the country is the fact that the young people drink too much. That's according to his piece in today's Irish Times demanding that the powers-that-be "stand up to the drinks industry". Really? I've a suggestion for Dr Loftus - there's no need to stand: the drinks industry in Ireland is on its knees reeling from one blow after another. 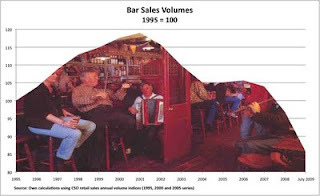 The volume of sales in Irish bars - according to my own calculations using historical CSO data and the latest July volumes indexed to 1995=100 - peaked in 2001 and haven't just fallen back since, they've even fallen back to levels last seen in the early 1990s (allowing for slight chances to the NACE code classification of bar sales). If this is the result of a rampant, uncontrolled, self-regulating Irish drinks industry - as Dr Loftus would have it - then let's face it: they're doing a crap job. In reality, these trends have little to do with the manipulations of the drinks industry. Rather it's down to demographics (the number of beer-swilling 18-24s peaked around 2001); economics (the relative price of booze in the off-licence is an awful lot lower than in pubs); and legislation (drink driving laws has had a sobering effect; and the smoking ban didn't help either). The problem with the approach of Dr Loftus and other neo-prohibitionists like him is that they don't care for the majority of alcohol drinkers who actually benefit from alcohol consumption. Instead they would control and deny access to alcohol to the majority of Irish citizens (and its legitimate promotion by those supplying alcoholic beverages) in order to tackle the problems of a tiny minority of alcohol drinkers. An even bigger problem for the neo-prohibitionists is that they 'protest too much'. The problem of alcohol abuse in Ireland is a rapidly declining problem - as I've noted before in relation to the SLAN survey of health and lifestyles. Most of their cost-benefit analyses of alcohol consumption tend to leave out the benefits, and to assume that all the costs are social costs borne by the health and welfare services and ultimately by the taxpayer. Such was the claim of the recent BERL report in New Zealand, which was rightly criticised for its one-sided 'cost-only' analysis of the consequences of alcohol consumption. The usual implication of such reports is that the goverment should raise taxes on alcohol: indifferent to the fact that such policies end up punishing the vast majority of drinkers who enjoy considerable benefits from light to moderate consumption. Ironically, by doing so, responsible drinkers will cut back on alcohol consumption thereby reducing the benefits of same, and end up in the long run demanding more of the health services than would otherwise have been the case! Moreover, those like Dr Loftus who would prevent alcoholic drink companies from sponsoring sports events etc simply assume that the considerable amounts of money that such sponsorships provide to sporting bodies such as the GAA and IRFU will magically appear from elsewhere. 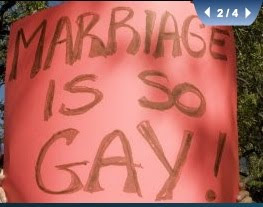 I don't think so - not in the current economic climate anyway. But if they succeed then expect even more demands on the taxpayer as Ireland's sporting bodies struggle to meet the costs of providing national, regional and local resources to children, youths and adult participants. Which will leave us with yet another 'unforeseen consequence': less sporting activities for young people and a worsening of the already serious problem of childhood (and adult) obesity in this country. Now there's an acute social problem in the making ... unforeseen of course. There you go: another 57,500 certified young people. I congratulate them all. Now what? IBEC is fretting that the numbers of students taking higher level maths and subjects with higher maths requirements are lower than before. But does it really matter? No, the economic problems of the future will not be about growth but about something more nettlesome: the ineluctable increase in the number of people with no marketable skills, and technology's role not as the antidote to social conflict, but as its instigator. The battle will be over how to get the economy's winners to pay for an increasingly costly poor. If robots can crowd out all low-skilled workers, there is no reason they cannot also crowd out all high-skilled workers. Would this be bad? Growth would proceed so rapidly that the returns to even small amounts of capital should be outrageously high. The gap will be between those with income from capital gains and those with none. To prevent this, some version of Clark’s recommendation might be desirable. I’d recommend Charles Murray’s scheme for replacing the United States’ social insurance apparatus with basic income grants and mandatory retirement and medical savings accounts. In a world of doubling-every-fifteen-minutes Hansonian robot growth, the portion of GDP necessary to fund universal grants sufficient to ensure a modestly lavish level of consumption would be so trifling that no one would even notice. For now, we should try to hasten the arrival of this post-human economy, in which case we should try to optimize incentives to innovation and growth. Although innovation in the old economy is not spectacular, the old economy is much larger than the new economy. Renewing the old economy, therefore, contributes more to economic growth. 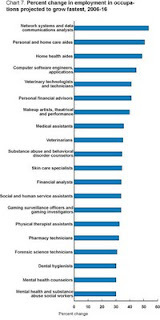 So those who bring some innovative zest to the role of care aide, makeup artist or 'counselor' might well do more to grow the economy and improve productivity than any amount of higher maths inspired pure research. Not that any of this will be of much consolation to those whose results today leave them with fewer CAO options than they had hoped for. But life opens up other options too - be open to that. It was another cultural reminder of France's Muslim population, and that country's ongoing debate about the relationship between the state and religion in schools etc. If anything it's a debate that is increasingly Europe-wide in its relevance and intensity. 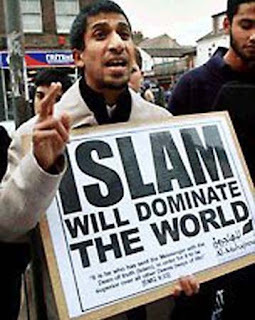 In just the past week there has been a flurry of media coverage about various projections claiming that France/Britain/Europe (select your country/region) will be Muslim by 2030/2040/2050. A YouTube video on Muslim Demographics - viewed over 10 million times - presents even more extreme forecasts about Europe's Islamic future. But of course demographic forecasts, especially in relation to religious affiliation, are notoriously prone to massive error. And as a recent, politely British hatchet job on the same video by the folks at the BBC's More or Less radio programme makes clear: if you start with the wrong numbers your forecasts are going to be even less accurate than if you use the right ones. But I am leery of any arguments based on 'demographic destiny'. I grew up a Catholic in Northern Ireland where we were assured that our higher fertility rate relative to Protestants would make a United Ireland inevitable! Destiny had other things in mind it seems. And so it is with most of the more fantastical - malicious even - forecasts for an Islamic Europe. I don't buy them: and I expect that Muslims in Europe will become more 'European' long before Europe becomes 'Muslim'. It's risky extrapolating from a sample of beach goers on the Cote d'Azur (selection bias and all that) but there do seem to be far fewer obese people in France than in Ireland (and certainly fewer than in the United States where I was on holiday last year). The French appear to be winning the battle against obesity, especially among French children. This is encouraging - obesity might not be our destiny after all. Though the search for explanations for the surge in obesity has ranged from genetics to fructose corn syrup to viruses. But the most obvious one in France is that most people walk more than in the United States or in Ireland for that matter. High density, apartment-dwelling , urban populations spend more time on their feet than in their cars. There is one other reason to expect the trend in obesity to be halted and even reversed: rising oil prices. If we are heading for another oil shock, then the good news, from a new US study, is that for every long-term $1 increase in gas prices, the national obesity rate drops by 10 percent. I guess more of us will be walking to the beach in that scenario. I do admire the French. Sure they're a bit dirigiste and statist for my liking: but at least they understand the workings of the price mechanism, unlike our own glorious leaders. 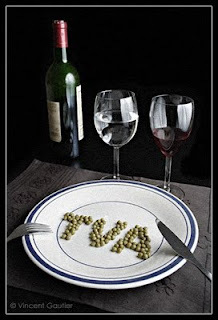 I'm in France this week, enjoying the weather and especially enjoying the cut in vat on restaurant meals introduced at the start of July. And we're not talking about tweaking the tax system here, we're talking about a ballsy cut from 19.6% to 5.5%. As a result, sales in restaurants have taken off. So you make something cheaper and people buy more of it ... amazing. Or at least it must be to the folks in the Department of Finance who had the ingenious idea of increasing vat, but for some reason vat revenues actually fell ... go figure. Maybe that's why the IMF expects France to have a 'good recession' - or at least one far less severe than our own. Suddenly 'dirigiste' and 'statist' doesn't seem so bad, or is that the sun getting to me ...? Your probability of dying during a given year doubles every 8 years. For me, a 25-year-old American, the probability of dying during the next year is a fairly miniscule 0.03% — about 1 in 3,000. When I’m 33 it will be about 1 in 1,500, when I’m 42 it will be about 1 in 750, and so on. By the time I reach age 100 (and I do plan on it) the probability of living to 101 will only be about 50%. This is seriously fast growth — my mortality rate is increasing exponentially with age. a reference to the long-term economic value of the property comprised in the security for a credit facility that is a bank asset is a reference to the value that the property can reasonably be expected to attain in a stable financial system when current crisis conditions are ameliorated and in which a future price or yield of the asset is consistent with reasonable expectations having regard to the long-term historical average. 'Reasonable expectations' - all very reasonable. 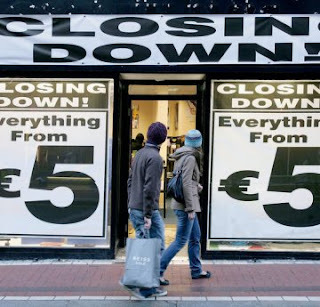 But what are reasonable expectations right now about the long term global economic outlook, let alone Ireland's? As a recent US Census Bureau report points out, some time in the next 10 years the global number of over-65s will be greater than the number of under-5s for the first time in human history. America is already beginning to fret about a leaner boomer economy as the boomer generation retires in ever greater numbers, curbing their spending and drawing down their savings (what little they have). Some even speculate that the shock of the recent economic crisis, combined with demographics, may well herald a new 'post-consumerist' America: with inevitably lower economic growth rates. ● The fact that the economy will take a few years to recover in national income terms. ● The “reconstruction” that households need to undertake to their balance sheets due to the high level of consumption. ● The higher level of saving that the next generation will probably undertake (certainly relative to recent levels of zero). ● The growth in government spending and regulation that will lower trend growth rate. ● The servicing of the huge level of government debt. 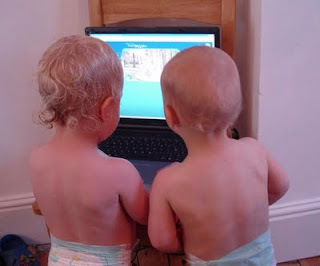 ● A welfare and tax system that (relatively speaking) penalises those who save and, more generally, make proper provision for their children - something that will continue to lead to high levels of workless households with children. ● The ageing of the population (which will really begin to bite when the other things are sorted out - if they are sorted out) and all that implies for state pensions, public sector pensions and state spending on health. So it would be brave indeed to assume that the long-term economic value of any Irish asset, property or bank for that matter is higher than its market value right now. Don't get me wrong: I'm all for painting positive pictures of the future - belief in progress, after all, is a healthy antidote to the existential threat of death. I would just like the government to take long run gambles that even Keynes or Gompertz would have thought stood a chance of success.